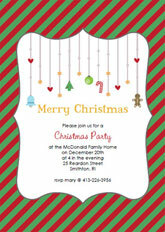 Looking for a quick and cool solution to make your own handmade Christmas party invitations? Using a postcard template is a great way to make creative, simple, and inexpensive invitations. These templates really are so easy to use! 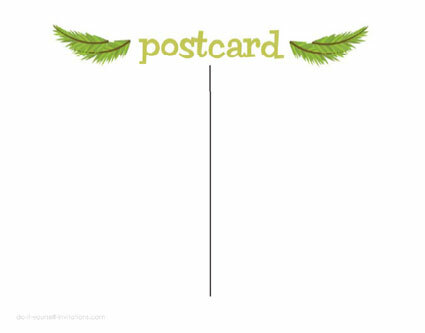 Just print the postcard template onto a good thick cardstock and cut it into quarters! This is such a perfect solution to on the fly or super casual parties, work parties, or even to use as a Christmas greeting card! 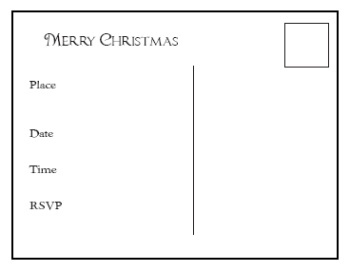 Fill in the party details, or a quick message to the back of the postcard using our interactive, editable template. Type in an address, add a stamp and pop it in the mail! It's complete print and go. What could be easier than that? 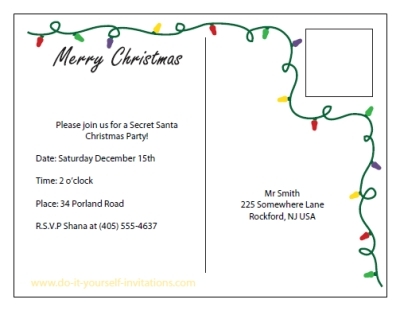 These customizable Christmas invitation postcards come as an interactive PDF file. You can completely personalize and customize the invitation wording and recipients address. The fonts, font size, color and alignment can all be changed to suit your needs. This is a super easy DIY solution to your invitation and greeting cards needs. You will need a current copy of Adobe Reader to use this template. To change the text and style of text simply download the file to your computer. After opening the file highlight the text you wish to choose. If a text tool palette does not immediately open, press and hold the "control" and "E" buttons on your keyboard. After you are done typing in the wording and recipient addresses, save a copy for your desktop and print! Cut the paper into quarters. Decorate the opposite side. You're ready to pop them in the mailbox! This template is a print only file. It's basically a fun arts and crafts postcard project. Hand write in all the details and add your own illustrations, stickers, or decorative paper accents to the opposite side. 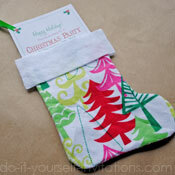 This is a great hands on Christmas crafts for a rainy/snowy day, or kids Christmas craft project! 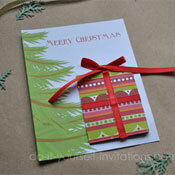 You can not only make invitations with this but greetings cards as well! You will need Adobe Reader (the latest version is recommendable) installed on your computer in order to open, print, and/or interact with these template files. You can get Adobe Reader here for free should you not already have a copy running on your computer. 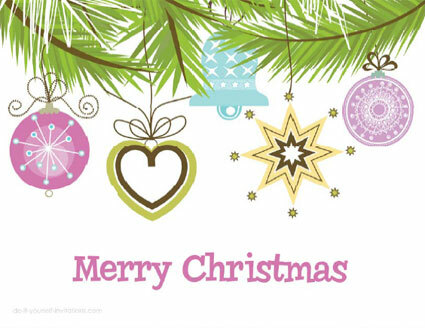 by using either some Christmas themed embellishments and craft materials or make embellishments yourself using some paper punches. One really important tip for making these postcards is to use a really good adhesive or glue to hold it all together. You want to make sure that the postcards are held together strong enough to withstand going through the mail.